Four Cedar Springs Police officers were sworn in as deputies Friday evening, November 7. 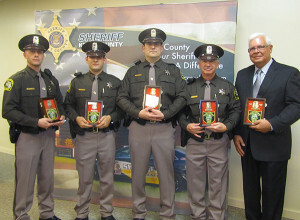 From left to right: Deputy Mike Stahl, Deputy Chad Tucker, Deputy Chad Potts, and Deputy Ed Good. Post photo by J. Reed. Four Cedar Springs Police officers were sworn in to the Kent County Sheriff Department Friday night, November 7, in a change of command ceremony at the Hilltop Administration building. Officer Mike Stahl, Officer Chad Tucker, Acting Chief Chad Potts, and Sgt. Ed Good are now officially Kent County Sheriff Deputies. Sgt. Jason Kelley, from the Kent County Sheriff Department, will be in charge of the Cedar Springs unit. The officers went through an unpinning ceremony, where their spouses unpinned their Cedar Springs badges. Officers Mandy Stahl and Jonathan Ludwick also participated in the unpinning, but will not be working for the Sheriff Department. Officer Mandy, who had been with the Cedar Springs Police Department for 12-1/2 years, decided to retire from police work, and is now working with animals at the Kent County animal shelter. Officer Ludwick was a part time officer. 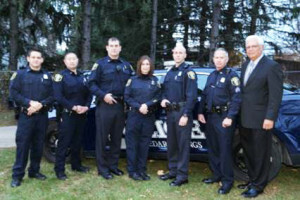 The Cedar Springs Police before the ceremony. From left to right: Officer Chad Tucker, Officer Jonathan Ludwick, Acting Chief Chad Potts, Officer Mandy Stahl, Officer Mike Stahl, Sgt. Ed Good, and retired Police Chief Roger Parent. Photo courtesy of Kent County Sheriff Department. After the unpinning, the officers then went out and changed into their deputy uniforms. Mayor Mark Fankhauser and others gave a few remarks to the audience during that time. “I want to express our sincere appreciation for the work they’ve done. They are top notch. They are still our police department, just with a different uniform. We will grow in a positive and dynamic manner and they will represent us on a much larger scale,” he said. Dan Koornydke, with the Kent County Board of Commissioners called it a big day, and historic for Kent County. “It’s a great thing we are doing. It’s a win-win for Kent County and Cedar Springs,” he said, noting that Cedar Springs will get all the resources that the Sheriff Department has to offer. 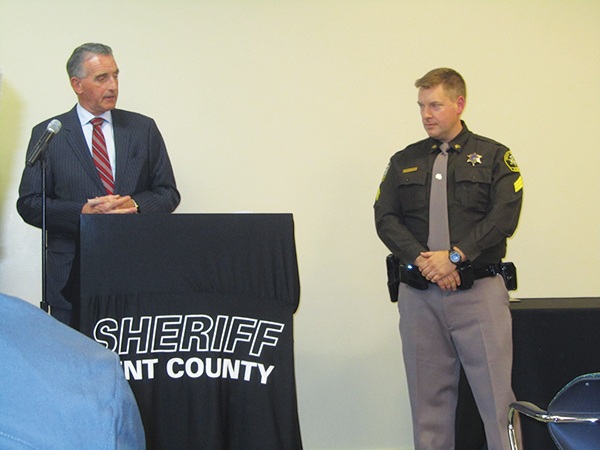 Sheriff Larry Stelma also called it a historic event, and the largest partnering program in Kent County. “It’s innovative and progressive, and you don’t hear that much with City Councils,” he noted. He thanked them, and talked about the meetings with City Manager Thad Taylor and former Police Chief Roger Parent that got the ball rolling. He thanked Kent County Administrator Daryl DeLabbio for his work with staff to make sure interests of both parties were met. Sheriff Larry Stelma (left) introduces Sgt. Jason Kelley (right), who will be in charge of the Cedar Springs unit. Post photo by J. Reed. Stelma also thanked the Cedar Springs Police Officers, who he said gave the program their vote of confidence. “It was a courageous move on their part,” he said. He also thanked his staff, including Chief Deputy Michelle Young, for working out all the details, and thanked the community for having faith in the Sheriff Department. 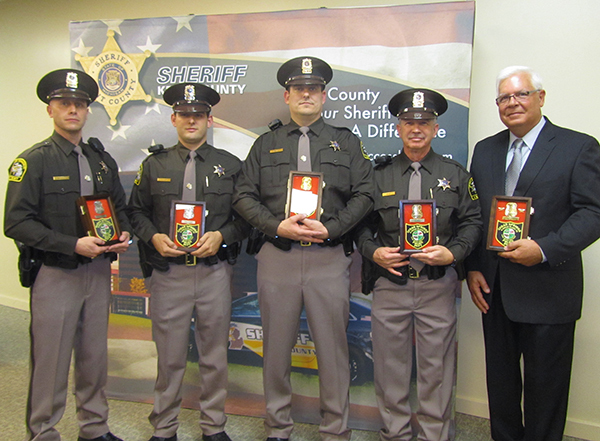 When the deputies returned, they were pinned with their Sheriff badges, and sworn in by Sheriff Stelma. Chaplain Larry VandeVoren, who also used to work for the Cedar Springs Police Department, said a blessing over the officers, asking God to keep them from harm. The officers and retired Chief Roger Parent were all presented with shadow boxes that contained a Cedar Springs Police Department badge and police patch. A shadow box was also given to the city to display.